How Many Types Of Kiwis Live In New Zealand? Kiwi, the national symbol of New Zealand is endemic to the country, and occurs in five distinct species with overlapping or separate ranges. 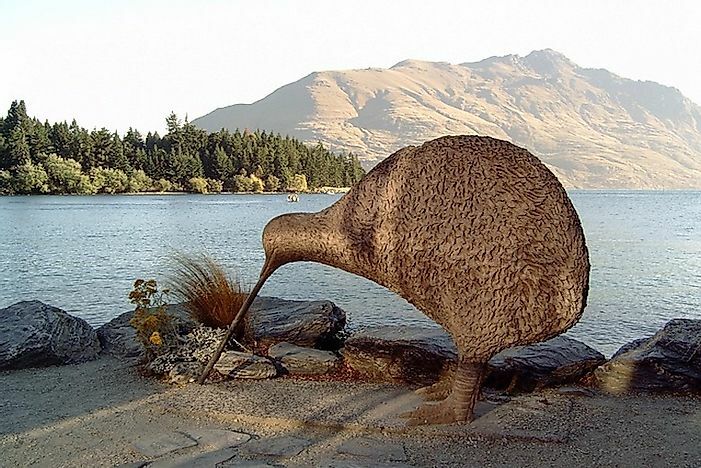 A kiwi statue in New Zealand, exhibiting the importance of the bird in the country. Native to New Zealand, kiwis are flightless birds of the genus Apteryx belonging to the Apterygidae family. The smallest of ratites, the birds are about the size of a domestic chicken. They lay the largest eggs compared to their body size. Currently, there are five recognized species of kiwis living in New Zealand. The kiwi is also the national symbol of New Zealand and often New Zealanders themselves are referred to as “Kiwis.” The kiwis living in the country have been subjected to historic deforestation but are currently living in protected habitats. Predation by invasive mammalian predators is the biggest threat to their survival. The North Island brown kiwi, (Apteryx mantelli) is found in New Zealand’s North Island. It is the most common species of kiwi with a population of about 35,000 individuals. The bird is a world record holder for producing the largest eggs relative to its body size. Within its range, the North Island brown kiwi lives on pine plantations, scrub-like farmland, and temperate and sub-tropical forests. Females of this species weigh about 2.8 kg and males weigh around 2.2 kg. The birds feed on invertebrates similar to other kiwi species. Although it is the most common species of kiwi, the North Island brown kiwi is classified as endangered. Again, predation by invasive mammalian species like cats and dogs is the primary threat to the survival of these birds. 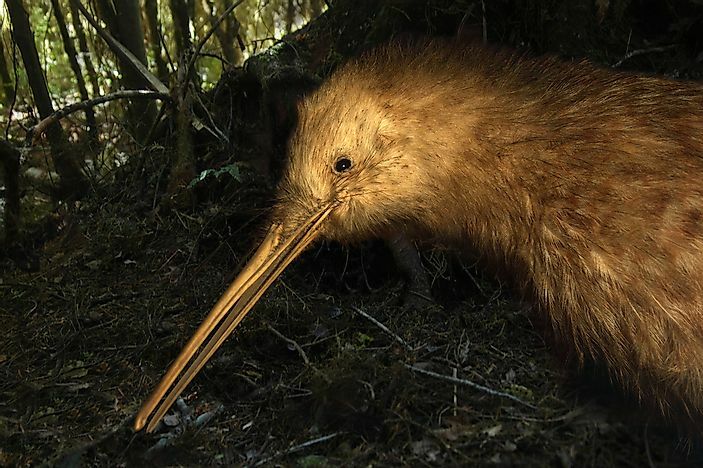 94% of kiwi chicks die before breeding due to predation. The common kiwi (Apteryx australis), also known as the southern brown kiwi, lives in the South Island of New Zealand. 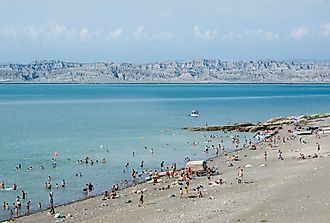 Populations are also found in the Stewart Island, Westland, and Fiordland. Within their range, the southern brown kiwi inhabits grasslands, shrublands, sub-tropical and temperate forests. The length of the kiwi varies from anywhere between 45 and 55 cm. The female weighs between 2.1 and 3.9 kg while the male weighs between 1.6 and 2.8 kg. It is a nocturnal species with a rufous-colored plumage with some streaking. The birds forage in the dirt in search of invertebrates. 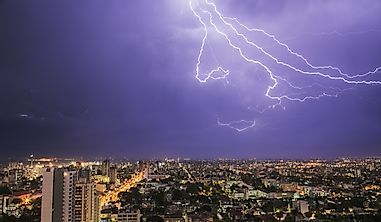 The birds have been classified as Vulnerable by the IUCN. 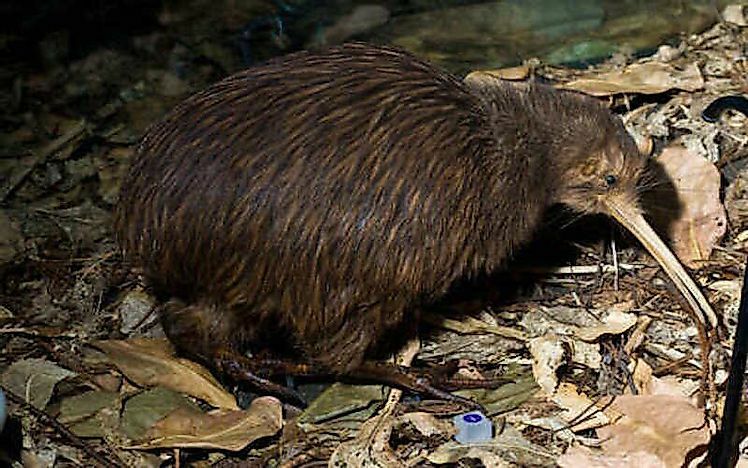 Predation by invasive species is the primary threat to these kiwi birds. The Okarito kiwi or the rowi (Apteryx rowi) is a bird of the kiwi family that lives in the Okarito forest of New Zealand’s South Island. 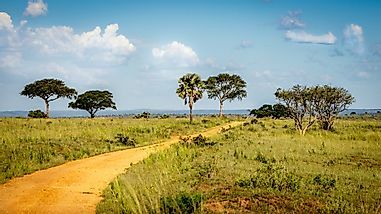 The forest hosts only about 400 birds. These birds have a long life-span and some specimens might live up to 100 years. Due to its restricted range and small population, the Okarito kiwi is classified as Endangered by the IUCN. Conservation efforts are in place to restore the population of this bird species. 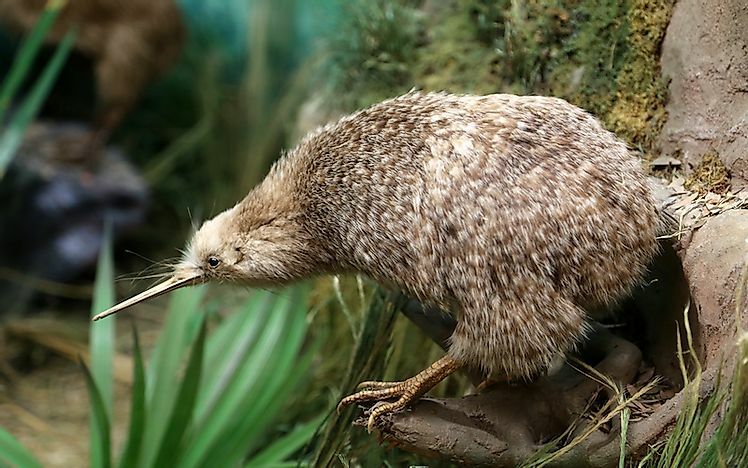 The little spotted kiwi (Apteryx owenii), also known as the little gray kiwi, is the smallest kiwi species weighing between 0.9 and 1.9 kg. The length of the bird ranges from between 35 to 45 cm. The bird’s feathers are a pale mottled gray and shaggy in appearance. 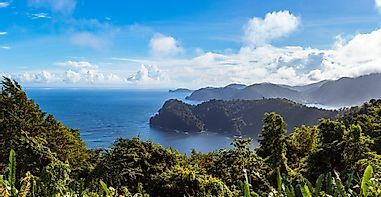 The species suffered a widespread population loss due to the introduction of invasive species by the Europeans and excessive hunting, which generated the need to relocate all the birds to the predator-free Kapiti Island in the 1900s. The birds gradually increased their range and in 2000, 20 birds were successfully released into the Karori Wildlife Sanctuary. These birds feed on small insects and grubs found underneath the soil. They also feed on berries. Since the size of these birds is quite small, they are highly vulnerable to introduced predator species like cats and dogs. However, as the birds have been relocated to a number of predator-free islands, this threat is minimized. The birds are currently classified as near-threatened on the IUCN Red List. The great gray kiwi or the great spotted kiwi (Apteryx haastii) is a kiwi species endemic to New Zealand’s South Island. The bird is a flightless species and the largest of all kiwis. Although once widespread throughout the island, the kiwis are currently restricted to the high altitude areas on the South Island. 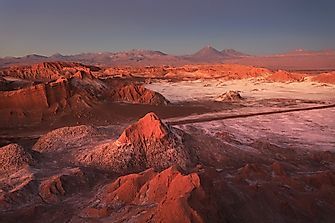 The birds live in complex, maze-like burrows in their habitat. 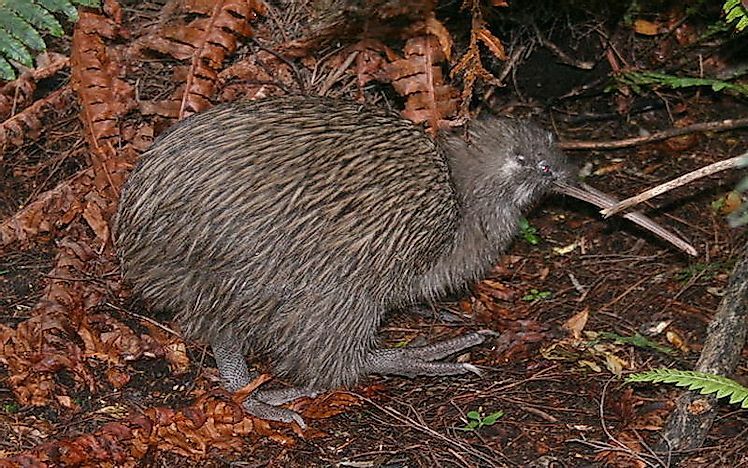 The male kiwis are 45 cm tall and females are slightly larger, being about 50 cm tall. The males weigh between 1.2 and 2.6 kg, and the weight of females range between 1.5 and 3.3 kg. The birds mostly rely on their sense of smell as they have extremely small eyes. They feed on grubs, earthworms, spiders, beetles, and a variety of other insects and arachnids. They also consume seeds and berries. The plumage of these birds range from light brown to charcoal gray. The bird is classified as vulnerable by the IUCN and the populations have experienced a 43% downfall in the past 45 years. These birds are monogamous in nature and often pair for over 20 years.